Okay, I tried Overkill 2 game. I might not ever play the first one (Overkill), but it doesn't matter, also I don't think the game has a sequel story line related into the first one. Cause the game is only shoot, shoot, and shoot, and survive as long as you can. I'll post some tips and trick of this game later. Overkill 2 has been released since late last month on some AppStore only. Finally, Craneballs released it worldwide on April 4. There's no story line in this game. All you need to do is kill your enemies. There are 2 mode of the games, Battle mode and Survival Mode. The battle mode consists of 20 stages for each area (current version has 3 area, so total there're 60 battles). It's kind of Tower Defense game, which some wave (enemies) come to attack you, and you must survive till the wave cleared. And to defense your self, you need to shoot all of your enemies. Nah, here is the best part. In the first time, I found it might bit weird for me to play, but it's really attract my reflex to shoot. So, after a few minutes, I know how to play the game properly. 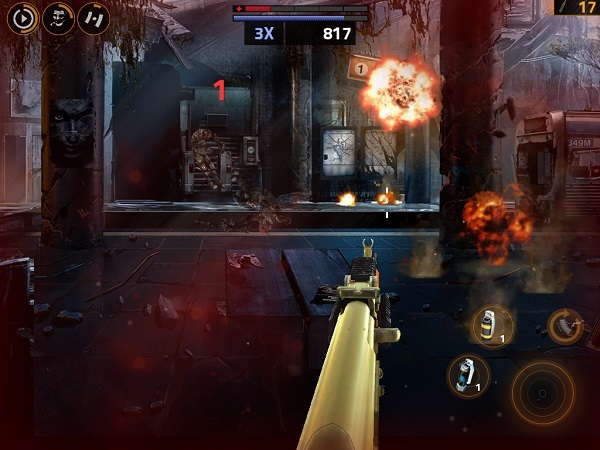 The control are great , the left screen is to set the position of your gun, and the button in the right screen is for shooting. To reload the bullets, just shake your device or reload it manually using the reload button in the right side. Some power ups box, such as Air-Strike (BOM), Healthy Box (+30% health), Armor are really useful during the game, so don't forget to shoot the boxes too when you see them. The game is free-to-play. However, I don't think the IAP is agressive enough, there're about 30 kinds of guns in the shop, also Black Market guns. The game has 2 kinds of currency, coins and overkill medals. You'll get 5 medal for each time you level up or complete some missions. The coins which you can get is about 3000-5000 for each playing in battle mode, and relative for survival mode. 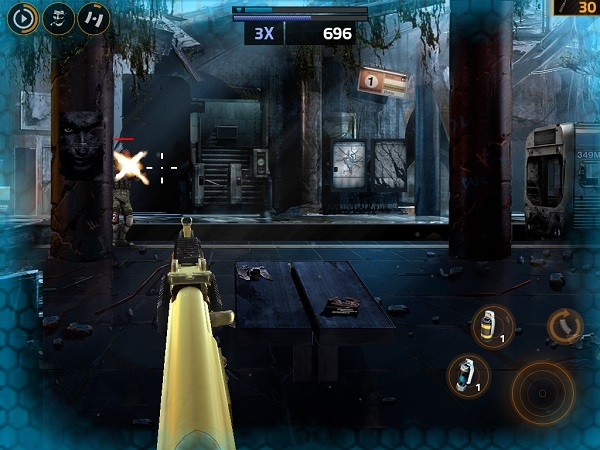 Only, if you want to buy the best guns directly, you'll need to buy the IAP, but if not, the grinding is so much fun. Just do the grinding on survival mode. Unlock the survival mode on rank 10 (if i'm not wrong, forget for this one), 15, and 20. 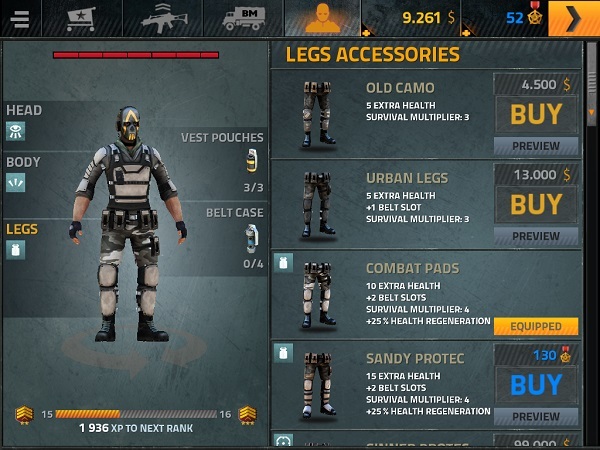 In the shop, you can also prepare your army from head to toe (build your best armor to defense yourself). Buy some grenade or medkit if necessary. Note: It will coming soon in to android, I'll update the link later after they release it.